Joey Barton is tempted to strengthen Fleetwood's midfield before the transfer window closes but the Town boss is delighted with the competition for places in attack. 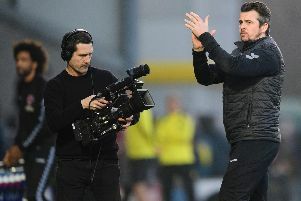 Joey Barton is tempted to strengthen his midfield before the transfer window closes but the Fleetwood Town boss is delighted with the competition for places in attack. Speaking after Ched Evans scored on his first Fleetwood appearance in the 2-0 friendly win at Tranmere Rovers, Barton was pleased with Town’s goal threat. That attacking ethos also saw Kyle Dempsey score for the second game in a row in his new left-sided role. Head coach Barton said: “We’ve got a number of options in those wide slots – the likes of Conor McAleny, Ash Hunter, Bobby Grant and Wes Burns, who came on and made a great impact. “Kyle Dempsey got his goal and his all-round play was good. It is not just for the wide roles in his front three that Barton has healthy competition and he was overjoyed at Sheffield United loanee Evans’ debut, adding: “Ched made a great run and finished as we all know he can. “With Paddy Madden, Ched and obviously Ashley Nadesan in competition for that number nine spot, I think we’re in a really healthy state. They are really good players. But Barton admitted that a young midfield, which on Saturday included development squad defender Nathan Sheron alongside Harrison Biggins and Jason Holt, might need some added experience. With Rangers loanee Holt set to miss the season-opener against Wimbledon on Saturday week due to suspension, it would be no surprise to see 20-year-old Sheron make his EFL debut. Barton said at Tranmere: “For me we look a little bit young in midfield at the minute. Nathan Sheron and Harrison Biggins did well in there today. “Jack Sowerby was another youngster in there. If we could add a little experience to the midfield we might take the opportunity. Evans was one of three signings made by Town on Friday, alongside forward Chris Long and midfielder James Wallace, but was the only one of the trio considered fit enough to feature at Prenton Park. Evans, who took Town’s total of summer signings to nine, said: “I’m just getting that hunger back to play again and score goals, which is really pleasing. Fleetwood’s next pre-season fixture is at Morecambe on Saturday.